Though Penetrex and BioFreeze are both among the best-selling pain treatment products, hold on a sec before you run to the nearest drugstore! They are priced very differently, and they are perhaps not to be interchangeably used because they have distinctive characteristics. Penetrex is best for one case, BioFreeze for the other. We are going to see what things set them apart and whether you need Penetrex or BioFreeze. Have a look : BioFreeze Vs Sombra. Penetrex is typically not smelling or burning as much as most pain-treatment products, yet still very reliably effective. This is because it delivers the treatment through its chemicals, not cryotherapy. This can be seen by reading its ingredients list, in which there are Vitamin B6, MSM, Pyridoxine, Arnica, Glucosamine, and Cetyl Myristoleate included. Neither paraffin nor petroleum is used, so do not worry about some oily-textured leftover. The cream will be properly absorbed into your skin to do its job. Penetrex is the best choice for joint pains. It can be used for muscle, too, but most people prefer a soothing sensation for muscle pains. BioFreeze, on the contrary, brings some super cold sensation on the addressed area. The product relies on cryotherapy by using menthol as the primary active ingredient. It is available in roll-on and gel. BioFreeze gives some minty smell which does not last long, too. It is also absorbed well by the skin without any annoying residue. BioFreeze is the best option for muscle pains, especially because of its cold, soothing effect. Therefore, the conclusion is plainly clear. 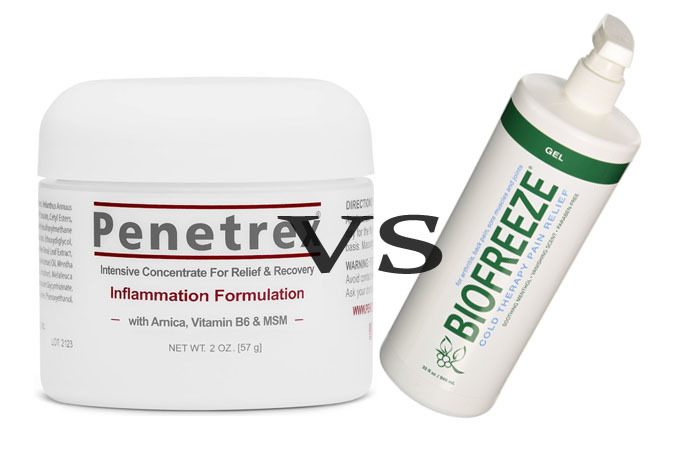 Penetrex for joint pains, BioFreeze for muscle pains.